How Common Are Potential Habitable Worlds In Our Galaxy? Imagine this scenario: You are planning to buy a new house in a nice neighborhood. The schools in the area are good, the neighborhood is very safe, but you want to know the ‘kid friendly’ area (so that your kids can have friends). You drive around, looking at the available houses, watching for any ‘kid signatures’. You notice that a good proportion of the homes in your neighborhood show some ‘potential’ to have kids. Based on your observation, you estimate the percentage of houses with kids. A very similar process is currently being carried out in the field of ‘exoplanets’: planets orbiting other stars. The past two decades have seen a rapid increase in the discoveries of exoplanets (although, if you follow the International Astronomical Union’s definition of a planet, exoplanets are not technically ‘planets’. But that discussion is for another time). 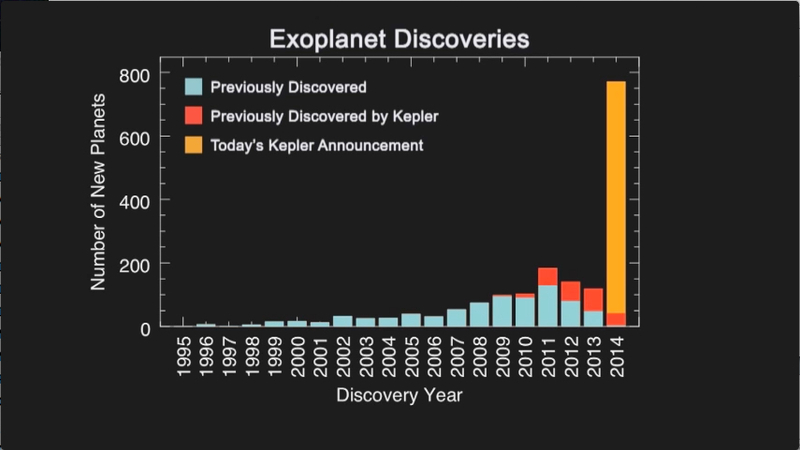 Just this year, the number of confirmed exoplanets has almost doubled in number. The discoveries in the first decade and a half were dominated by the radial or Doppler velocity technique, where an orbiting planet causes the star to wobble, and the light from the star, split into various colors, also wobbles, providing some clues about the mass and orbital period of the planet. But the floodgates to the exoplanet discoveries really opened up after the launch of NASA’s Kepler space telescope in March 2009. Kepler finds planets using the ‘transit’ method: A planet crossing in front of a starblocks a portion of the star’s surface from the observer’s view, causing the light from the star to decrease proportional to the area of the planet’s disc. 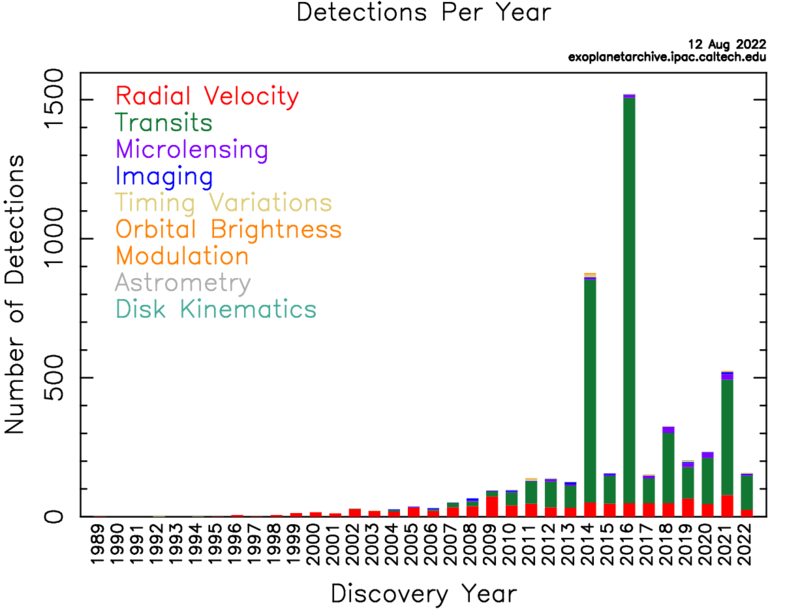 Just this year, theKepler mission has more than doubled the number of exopanets discovered. Although it is easy for Kepler to detect large planets, like Jupiter or Saturn, closer to their stars (because they can block a larger portion of the star’s disc), there has been a huge increase in the Earth-size planet population from this recent discovery. And there has been a modest increase in the Jupiter or Saturn type planet population. That meansKepler probably has detected most of the giant planets that it can detect, and a large population of Earth-size planets are just being discovered. Now, what is of interest (to me, and hopefully to many of you) is how many of these Earth-size planets are potentially habitable? We do not know if these planets indeed have habitable conditions, but we do know how far away they are from their host star. And if they are at the “right” distance from the star, the so-called ‘habitable zone’ (HZ) where liquid water can be sustained on the surface of a planet with appropriate atmospheric conditions, then they are good candidates for potential habitable worlds. But, how do we estimate the habitable zone (HZ) around a star? ‘Not too hot, not too cold region’ is a nice guess, but a more rigorous approach is needed because we can’t measure a distant exoplanet’s surface temperature. Furthermore, the location of the HZ varies depending upon the star. And we are looking for those kinds of planets, which have similar atmospheric composition as Earth (because we know whatever Earth has, works for life and we know what kind of life signatures to look for). This is where climate models come into the picture. Recently, I along with my group at Pennsylvania State University and collaborators from NASA Astrobiology Institute’s Virtual Planetary Laboratory, used a climate modelto estimate HZs around various kinds of stars. We assumed an Earth-mass planet, with Earth-like composition, and determined the boundaries of HZ for different stars . The results are shown in Figure 1. On the horizontal axis is the amount of ‘starlight’ a planet receives: For example, a value of ‘1’ represents a planet receiving the same amount of light from its star, as Earth does from the Sun. A value of 1.25 implies the planet receives 25% more light than Earth, and a 0.75 indicates it receives 25% less light than the Earth. The vertical axis shows stars of different sizes (or temperatures). Hotter stars are at the top, cooler stars at the bottom. 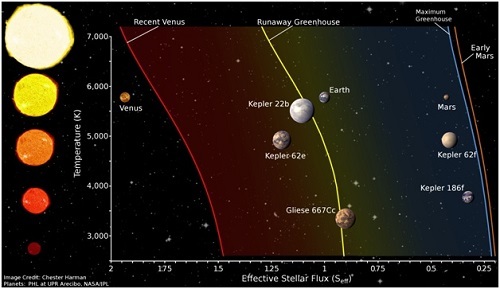 The yellow curve with the label ‘runaway greenhouse’ implies that the planet is so hot (because it is closer to the star), that at that location all the water from the surface of a planet is evaporated and resides in the atmosphere (kind of what happened to Venus billions of years ago). This is the ‘conservative inner edge of the HZ’. There is an `optimistic inner edge of the HZ’, which is shown as the red curve labeled `Recent Venus’. This limit is based on the observation that Venus seems to have lost its water by 1 billion years (Gyr) ago, when the Sun was 8% less bright than today. Basically, an Earth-mass planet in the blue shaded area has a good chance of having liquid water on its surface (if it has the right atmospheric conditions), and it may have some water if it lies in the red shaded region. We also changed the planet mass to see how the HZ changes. Assuming similar composition as Earth, larger planets have wider HZs than do smaller ones. Figure 1: Habitable Zones around various stars. The horizontal axis indicates the amount of starlight a planet receives compared to the Earth: A value of 0.75 implies the planet receives 25% less light than Earth does from the Sun. Similarly a value of 1.25 indicates the planet receives 25% more light and so on. The vertical axis is the star’s temperature. The blue and red shaded regions are conservative and optimistic widths of habitable zones, respectively. Some of the known exoplanets, that are potential habitable worlds, are also shown. Image credit: Chester Harman. You can see from Figure 1 that many of the Kepler-discovered (and confirmed) exoplanets that are of Earth or near Earth-size reside in the HZ. So we can count them and obtain an answer to our question: “How common are potential habitable worlds?” But that counting doesn’t tell us the whole answer. The Kepler telescope finds a planet when the planet crosses in front of its star, observing the dip in the starlight. Not every planet does this: some planets may be aligned in such a way that they may not be crossing in front of the star. So we may be missing some of them. And we have not confirmed that all the Kepler detected planets indeed are planets, or even Earth-size. To complicate matters, there are some imposters: two stars orbiting around each other can produce a signal as though a planet is orbiting around a star. So one needs to be careful in considering all these issues when calculating the commonness of Earth-size planets. In the past year, there have been some estimates of the occurrence of Earth-size planets in the HZs. Prof. David Charbonneau and his graduate student Courtney Dressing at Harvard University used Kepler data and calculated that about 15% of low-mass stars, the so-called M-dwarfs that are cool and red, in our Galaxy have Earth-size planets in the HZ. This is a big number and great news! Dressing and Charbonneau have done a phenomenal job of calculating this number. That means nearly 1 out of 7 M-dwarfs in our Galaxy may have a potential habitable planet. But even this number seemed low to me. M-dwarfs are the most prevalent stars in our Galaxy. About 77% of stars in our Galaxy are M-dwarfs. Within 30 light-years of the Sun, there are nearly 250 M-dwarfs(whereas, there are only about 20 Sun type stars). So I recalculated Dressing & Charbonneau’s estimate of the prevalence of potential habitable planets, using my newly determined HZs (Figure 1). And the number I got is a BIG increase from 15%: aconservative estimate showed that about 48% of M-dwarfs should have Earth-size planets in the HZ. That means, nearly 1 out of 2 M-dwarfs (i.e, approximately 50% of M-dwarfs in our Galaxy) may have Earth-size planets in the HZ! Did you ever get that euphoric feeling when you discover something that is really cool? Well, I was in that moment and nearly jumped out of my chair! 48%, and that is aconservative estimate! I had absolutely no prior expectations of what that number could be, except that it may be bigger than 15%. For the first time in the history of human civilization, we not only know there are Earth-size planets around stars, but also that there are a good number of them that could be habitable! The next obvious question is: “How common are potential habitable worlds around Sun-like stars?” A recent study by Eric Petigura and Geoff Marcy of University of California at Berkeley (with Andrew Howard at University of Hawaii) estimated that about 22% of Sun-like stars have Earth-size planets in the HZ. That is 1 out 5 Sun-like stars in our Galaxy have Earth-size planets in the HZ. That is an amazing discovery! Figure 2: Planet size versus the amount of starlight incident on a planet. The green box shows the assumed HZ width in a study by Petigura et al. (2013) to calculate how common are Earth-size planets around Sun-like stars. Image credit: Petigura et al. (2013), Proceedings of National Academy of Sciences, 110, 48. 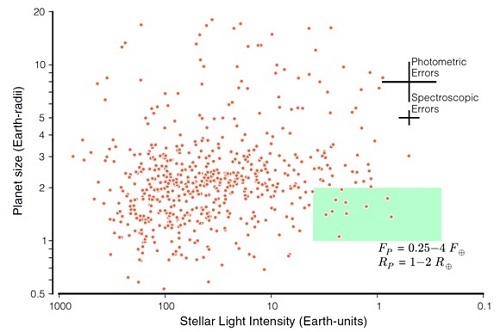 Petigura and collaborators assumed that for Earth-size planets around Sun-like stars, the inner edge of the HZ is at 0.5 AU, or at a distance where a planet receives 4 times the starlight the Earth receives from the Sun (See Figure 2.). Some people, including me, think that a planet at 4 times the Earth flux will be too hot to have liquid water on its surface. For example, Venus, which is the hottest planet in our Solar system, receivesonly 2 times the Sunlight that Earth does. And it is not a habitable place. Furthermore, looking at Figure 1 which shows HZs for different kinds of stars, even the most optimistic HZ estimate from climate models (based on the physics of atmospheres) indicates the inner edge of the HZ cannot be much closer than about 1.75 times Earth flux. So certainly 4 times as inner edge is too close to the star! When we use the correct HZ limits from Figure 1, the Petigura et al. (2013) estimate for potential habitable worlds around Sun-like stars actually drops to about 10% (i.e, 1 out of 10 stars)! That looks like a low number, but note that Petigura et al. do not consider planets smaller than 1 Earth radii (because their analysis method, quite appropriately, is not sensitive to those small planets). But Dressing & Charbonneau, and my analysis of M-dwarfs, does consider planets smaller than 1 Earth-radii. So, if one wants a consistent comparison between all these studies, a reanalysis of the calculations should be made. If not 22% (or 10%) for potential habitable worlds around Sun-like stars, what number can we expect? Well, recently, along with my colleagues Stephen Kane and Shawn Domagal-Goldman, I published a paper looking at how common Venus-like planets are. And we found that this number is about 45% for Sun-like stars. Figure 3 shows the “Venus Zone”, with some candidate planets detected by the Kepler mission. Interestingly, Petigura et al. find that the planet distribution remains flat at longer periods. What this means is that the number of planets at longer orbital periods remains the same. So if Venus-like planets, which are just near the Earth-like range, are as prevalent as 45% around Sun-like stars, then does it mean Earth-like planets are also as prevalent as 45%? At this point this is speculation based on non-rigorous analysis. 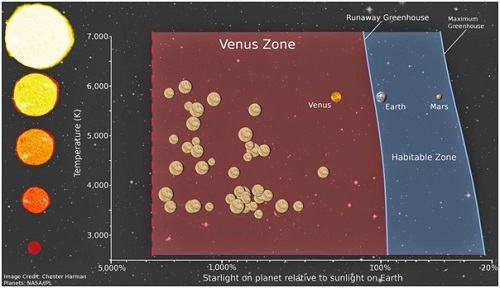 Figure 3: Similar to Figure 1 that shows the Habitable zone, this figure shows the “Venus zone”, the area around a star in which a planet is likely to exhibit Venus like conditions. Some of the candidate planets discovered by the Kepler mission are shown as yellow circles. The size of the circle is compared to the size of Venus. Image credit: Chester Harman. Returning back to where we started about the analogy of buying a house: Now let’s say you purchased a house. You moved in with your family. You want to introduce yourself to your neighbors. So, you knock on your neighbor’s door. Nobody answers. You knock on your other neighbor’s door. No response. You try every house on your street and in your neighborhood. Silence is all you hear. There is no response from anyone. There are just houses, no people that you can see or talk to. This is more or less the current situation humanity is pondering. We see lots of houses (planets), but haven’t seen life yet. Maybe we needed to look harder. Finding life on a distant planet has a profound importance to humanity. It can unite us to work towards a common goal, and focus more on our strengths than weaknesses. We have to commit ourselves, to invest in technologies and telescopes, which can find inhabited worlds. We know potentialhabitable planets exist. We know they are quite common. We even know (or will know soon) where they are in our Sun’s neighborhood. What are we waiting for?